I only started this little quilt last year, but now here it is all finished up. I got pretty frustrated at how slow the hand quilting took. I was a beginner though, I should have known. So, last year I told myself I had no time to do this and balled it up and threw it in my closet. Yes, that’s how to deal with ones problems…ball them up and ignore them. But a couple weeks ago I was cleaning said closet and found my little forgotten quilt. Since I was back watching Dr. Who, it seemed like a perfect time to pick it up again. (Dr. Who and I needed a break, but then while browsing pinterest one night I saw David Tennants face and told myself I’d give him another shot). I almost gave up after Rose left. Oh my heart. So anyways, back to my little quilt. Its my last crib sized quilt for now. 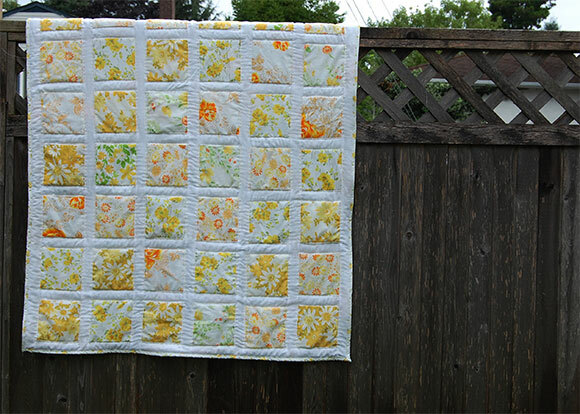 Machine pieced together with vintage floral sheeting in yellows and oranges. 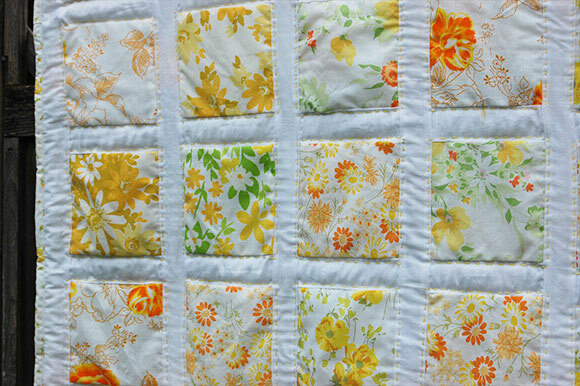 I then hand quilted around each square with a pretty bright yellow cotton thread. I thought about hand binding that, but my sloth won that battle and I just ran it through my machine. No patience for that. I barely finished this sucker after a year. The backing is a vintage sheet that was my grandmas. I love that fabric, but I think its the last piece that I have.